When talent buyer Jack “Skippy” McFadden abruptly parted ways with Union Hall and The Bell House a couple of weeks ago, it sent shock waves through the NYC indie music community. If you’ve been following Jack on Facebook, you might have a clue as to what he’s been up to lately, but until today all of that has just been rumor and speculation. Because I’d been badgering him for weeks, Jack agreed to give me this exclusive interview and officially let the cat out the bag on his “jazzy” new gig at Park Slope’s The Rock Shop. Bumpershine: What is your official title at The Rock Shop? Bumpershine: Are you sharing the booking duties with anyone else? Bumpershine: What is the capacity of the showroom Rock Shop? Bumpershine: When will the showroom will open? What will the first show be? Skippy: July 7, we’ll do a free show. July 9 & 10 we’ll be open too, and shows throughout July, but the “grand opening” will be August 2. Bumpershine: You’ve booked a couple of shows at Littlefield and for the Northside Festival, will you stop booking shows elsewhere when The Rock Shop opens for live music? Skippy: No, I’ll still have a small role in some other rooms, but this will be my main thing. 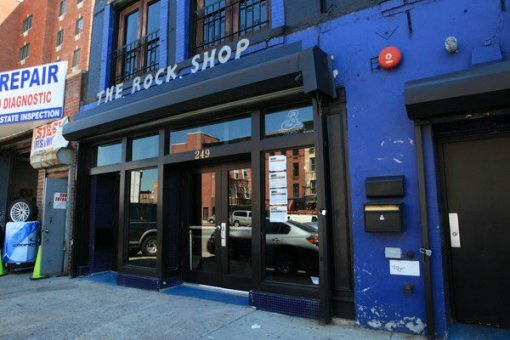 Bumpershine: Is The Rock Shop part of Bowery Presents? Bumpershine: In terms of music, what types of musical genres can we expect to see at The Rock Shop? Skippy: Anything that makes sense for the neighborhood! Bumpershine: Can you tell me some of your favorite new records? Skippy: I love the new Tame Impala record. I think there’s a cool new psych thing happening out there. I also dig the new Janelle Monae, New Pornographers, and Memory Tapes records. Bumpershine: What’s the next Brooklyn band that will blow up? Skippy: MNDR or Beach Fossils. Bumpershine: How long will the “icing” meme last? Skippy: Only until they replace Ice with something else like Jack Daniels and call it “jacking”. Bumpershine: Anything else you’d like to say? Skippy: I’m very happy right now. Bumpershine: Thanks Jack, see you on July 7th! PS The “jazz only” answer is a joke folks! I’m glad Jack got a room that is more of a suitable size for him. If he only gets 50 people here, it wont look as bad. Kudos, Jack!